The status system is the core of each RPG – with ORK Framework, you can create this system however you like, using status values. Status values are mainly used to calculate something (using formulas), like the damage of an attack, the chance an item is created and other things. Defines the maximum HP of a level. Defines the maximum MP of a level. Will be consumed when using abilities. The agility of a combatant. The dexterity of a combatant. The luck of a combatant. The experience of a combatant – this will cause level ups. Open the ORK Framework editor and navigate to Status > Status Values. We need 12 status values, so add 11 new ones to the already existing one and change the following settings. Click on Edit Value Range to change the minimum and maximum value of the status value. Select MaxHP (the status value we just created). A combatant will die if it’s HP reaches the minimum defined in the max. status value (i.e. the minimum MaxHP). Click on Edit Value Range. Select MaxMP (the status value we just created). We want a combatant to automatically level up if the experience exceeds a level’s maximum. We want the experience to build upon the previous levels – when enabled, the experience would start from the minimum value (e.g. 0) after a level up. That’s it for our status values – now we want to set up our player’s start values. There are two ways to do this, either define the values directly on the combatant, or use Status Development, which allows us to define a combatant’s development on different levels. Let’s use status development! Navigate to Status > Status Development. Change the following settings of the Default Development (the first status development in the list). Click on Edit Level Range to change the minimum and maximum level of this status development. Now we will edit the development of all Normal and Experience status values – the Consumable status value development is defined by their max. status value. We will use curves to define the values for the different levels. This is done in the curve editor. Let’s create the development curves for our status values. 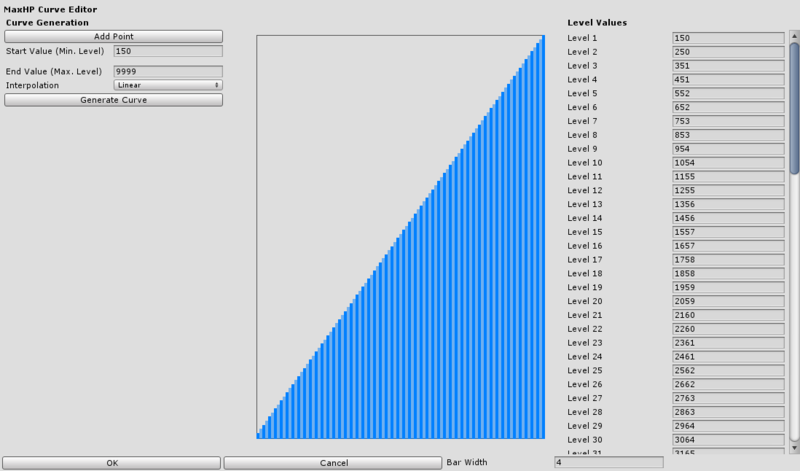 Click on Generate Curve to create a development curve. Click in Ok to accept the changes. This way the experience needed to level up will increase with every level. A Linear curve would result in the same experience needed for every level. That’s it for creating the status development, now we only need to select it on our player combatant. Navigate to Combatants > Combatants, select our player combatant Brown Pants and change the following settings. We want to use status development. Select Player Development (the status development we just created). Click on Save Settings to save all of the changes we made. Now your player will be able to receive experience and level up, the status values will be changed with every level the player gains. And that’s it for now – the next lesson will cover Attack and Defence Attributes.